Michael S. Gazzaniga, "the father of cognitive neuroscience", gives us an exciting behind-the-scenes look at his seminal work on the enigmatic coupling of the right and left brain. In the mid-20th century, Michael S. Gazzaniga made one of the great discoveries in the history of neuroscience: split-brain theory, the notion that the right and left hemispheres of the brain can act independently from each other and have different strengths. 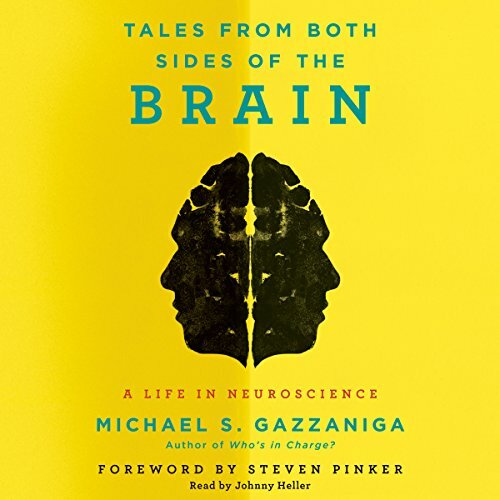 In Tales from Both Sides of the Brain, Gazzaniga tells the story of his passionate, entrepreneurial life in science and his decades-long journey to understand how the separate spheres of our brains communicate and miscommunicate their separate agendas. From his time as an ambitious undergraduate at Dartmouth, as a member of its now famed "Animal House" fraternity, and his life as a diligent graduate student in California to the first experiments he conducted in his own lab; from meeting his first split-brain patients to his collaboration with esteemed intellectuals across disciplines, Gazzaniga recounts the trajectory of his discoveries. In his engaging and accessible style, he paints a vivid portrait not only of his discovery of split-brain theory, but also of his comrades in arms - the many patients, friends, and family members who have accompanied him on this wild ride of intellectual discovery. By turns humorous and moving, Tales from Both Sides of the Brain uses an extraordinary discovery about the nature of human consciousness to tell an enthralling story of how science gets done. If this author had stuck to the brain science, the book would have been terrific. The personal and endless academic stories were boring and tiresome. I don't care what or where you ate when you were with another brilliant friend at another spectacular restaurant. If I had heard the word Dartmouth one more time, I would have gagged. How many times can one write about moving to another academic location and planning another meeting at some "special" location? The hyperbole drips at every turn. The authors friends and students were ALL brilliant and awesome and smart and well, just plain phenomenal. Much of the book was a giant self-directed pat on the back. I don't think I read one word about the author ever using their discoveries to help mankind suffering from neurological disease. The brain is interesting. The authors personal life and pretentious attitude was not. This book offers some interesting insights into the workings of the human brain, but those insights are needles buried in a huge haystack of autobiographical anecdotes that I found I particularly interesting or relevant and often quite tedious. 3.5 stars. Interesting memoir and tour through the history of split brain studies. Gazzaniga has an engaging manner and appears to have been blessed with a career filled with willing patients/subjects, high quality collaborators, and wonderful academic institutions. His high praise sometimes feels excessive, but one could not call him ungracious nor accuse him of the hubris and egotism that sometimes feels prerequisite to high achievers in the medical sciences (fairly or unfairly). The book is at its best when describing the function of the brain and how quirks in those who have undergone split brain procedures illuminates the workings therein. The vignettes about his life are fine, but don't add all that much (especially when they have little to do with his actual work). A few complaints in that he makes some statements that involve related fields (animal cognition and theory of mind; effectiveness of punishment) that make clear he is not well-versed in those areas (some of his statements on animal cognition go counter to the most excellent Frans de Waal book, Are We Smart Enough to Know How Smart Animals Are? ; and his discussion of criminal punishment seems completely unaware of research into how early life trauma impacts decision making and brain wiring). Nonetheless, while it is merely OK as a memoir, it is very good as a science book. From my book reviews you’ll find a pattern of bias against verbosity. This book, for me at least, is an exception to that bias. The author could have been more concise, but the book would be lesser for it. Professor Gazzaniga’s descriptions of the personalities involved and his interactions with them within the context of events in his life added flavor to what could be delivered as a very dry set of materials. This is the book I’ve enjoyed the most this year. I’m going out and looking for other books written by Professor Gazzaniga. So looking forward to the info but bogging down in the personality stuff which drags out. Wish i could finish it. If you could sum up Tales from Both Sides of the Brain in three words, what would they be? The author. He tells the story with ease. Have you listened to any of Johnny Heller’s other performances before? How does this one compare? The final chapter. It is exciting to see were we are now in the field. A wonderful story that takes you through the birth and evolution of a new branch in science as well as the role of the players that made it happen. Unfortunately, I have no friends interested in brain science. I discovered Michael Gazzaniga's work in 1996, and was so excited my heart pounded and I nearly passed out from hyperventilating. I am aways astounded by the construction of scientific research, and Gazzaniga's research is made all the more thrilling by his own excitement about his work. His articles and this book bleed his thrill at this work. One reviewer made the comment that he liked the science, but that was all. For me, seeing the whole picture of his life, his fellow scientists and the wildly painful decisions made as opportunities arose which required moving away from his wonderful homes and their histories of friends and fellow scientists, helped me place his work and life in context. That might be because I fell madly in love him with during my 1996 reading of an article he wrote, but for me, they are inseparable. He is loved, admired, trusted and respected. I join the crowd with joy. Well, I really have never heard Michael Gazzaniga's voice. But Johnny Heller reads this book like it was his own work and life he was describing. Beautifully narrated. And it's okay of Michael Gazzaniga has a little squeaky voice. I still love him.Heller could read to me from a phone book (do we still have those?) and I'd be thrilled. More than one, but all the same. He drew me deeply into his work and the amazing opportunities that he created (and that fell in his lap) and being deeply immersed (vicariously) in his work, the opportunities and painful changes that accompanied the opportunities of switching sides of our continent moved me deeply. It speaks of dedication and shows his family's devotion to him and to his work. Oh, and he loves tractors. I am so lucky to have stumbled onto Dr. Gazzaniga. I'm glad I got to be on this planet at the same time as he. Provides a great insider's perspective on how science is done and the life dedication required to discover and own the conversation.